WISHING ALL WHO READ HERE A BLESSED CHRISTMAS! Today we celebrate the incarnation—God taking on human flesh, a human body and mind in Jesus Christ. Throughout the Bible we find footprints leading to and from this event. “… Behold the virgin shall conceive and bear a Son…” - Isaiah 7:14. From the matrix of My mother He has made mention of My name” - Isaiah 49:1.
" And behold, you will conceive in your womb and bring forth a Son, and shall call His name Jesus" Luke 1:31. "And she brought forth her firstborn Son, and wrapped Him in swaddling cloths, and laid Him in a manger, because there was no room for them in the inn" Luke 2:7. The New Testament writers understand and communicate this incarnation in a variety of ways. “…but made Himself of no reputation, taking the form of a bondservant and coming in the likeness of men” - Philippians 2:7. “…great is the mystery of godliness: God was manifested in the flesh…” 2 Timothy 3:17. “… the Word became flesh and dwelt among us” - John 1:14. “Concerning His Son Jesus Christ our Lord, who was born of the seed of David according to the flesh” - Romans 1:3. “For what the law could not do … God did by sending His own Son in the likeness of sinful flesh on account of sin: He condemned sin in the flesh" - Romans 8:3. “Inasmuch then as the children have partaken of flesh and blood, He Himself likewise shared in the same that through death He might destroy him who had the power of death, that is the devil” - Hebrews 2:14. “For many deceivers have gone out into the world who do not confess Jesus Christ as coming in the flesh. This is a deceiver and an antichrist” - 2 John 1:7. And meet. For eyes, just take two suns and shrink them. PRAYER: Thank You, Jesus for inhearting, immarrowing, emboning, enmeating Yourself for us—for me. May I never lose my awe of and gratitude for this. Amen. 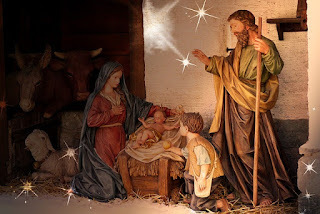 Today the church celebrates the Feast of Christmas.